2. Combine blueberries and 1 cup water; cook slowly 5 minutes. 3. In another pan, combine currants and 1 cup water; cook slowly 10 minutes, then press through a sieve or food mill to remove seeds. 4. 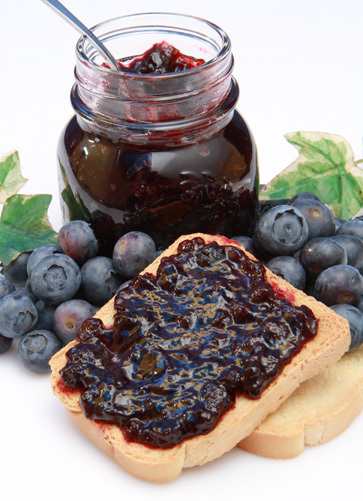 Combine blueberries and currant pulp; cook rapidly 5 minutes. 5. Add sugar, stirring occasionally until sugar dissolves. Cook rapidly until thick, about 20 minutes, stirring frequently to prevent sticking. 6. Pour hot mixture into hot jars, leaving 1/4-inch headspace. Source: So Easy to Preserve 4th ed. 1999.